Natural texture cysteine perm (Normal & Resistant Hair) is the industry’s most gentle perm that yields healthy, beautiful, voluminous, soft curls. Natural texture cysteine perm is ideal for normal hair. 1. SHAMPOO: Gently shampoo hair with clarifying shampoo and towel dry. 2. WRAP: Block damp hair into sections and wrap. Do not wrap with Waving Lotion. If hair dries, lightly mist with water. Wrap smoothly with minimal tension. 3. ADD DEODORIZING ADDITIVE INTO WAVING LOTION, THEN APPLY. Place cotton around hairline and towel at the nape of neck. Pour Additive into Waving Lotion and shake gently. Puncture tip of Waving Lotion with T-pin. Apply lotion, saturating each rod thoroughly and evenly. Note: Waving Lotion will appear green in color with no residual effects. Place plastic cap over all rods and secure. Do not process under dryer or heat source. 4. RINSE: Rinse hair thoroughly for at least 5 minutes with warm water. Towel blot each rod thoroughly. 5. NEUTRALIZE: Shake Neutralizer. Puncture tip with T-pin. Thoroughly saturate each rod. Save 1/2 oz. (15ml) for later use. Wait 5 minutes. Gently remove rods. Work remaining Neutralizer through hair for 1 minute. 6. RINSE: Rinse hair thoroughly for 3-5 minutes with warm water. Towel blot. Wait 48 hours before shampooing or conditioning. 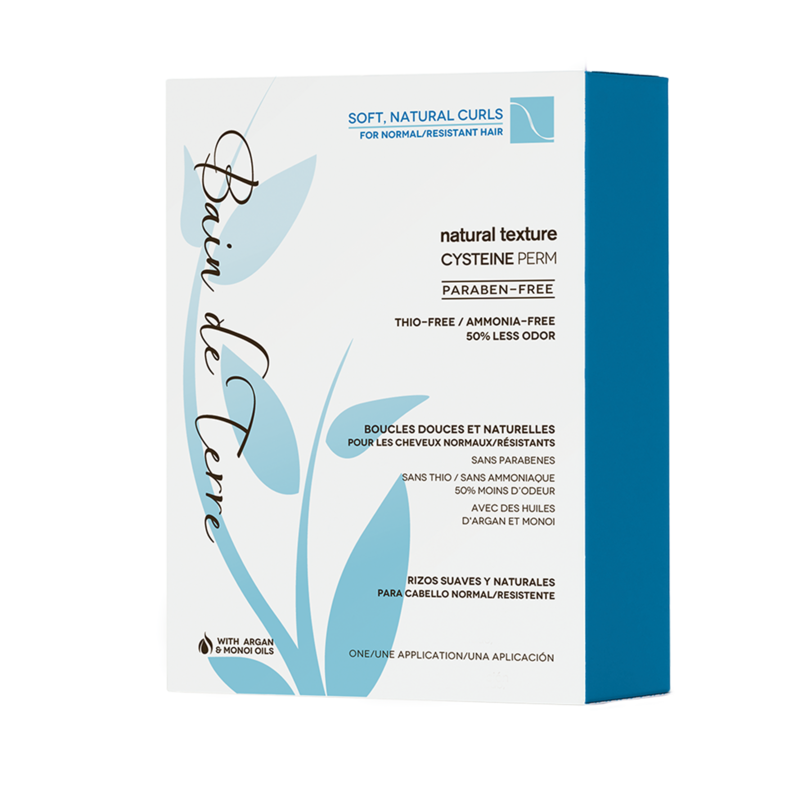 Natural texture cysteine perm features a low pH level and is free of thio and ammonia. The formula contains cysteine, a natural amino acid, which – due to its natural origins - provides the gentlest form of perming and acts as one of the most natural and safest reducing agents on the market. The advanced, patent-pending additive significantly reduces perm odor during and after processing as all-natural alfalfa extract provides additional proteins and vitamins to strengthen and moisturize the hair. Waving Lotion: Water/Aqua/Eau, Cysteamine HCl, Cysteine HCl, Ethanolamine, Laureth-23, Sodium Bicarbonate, Sucrose, Tetrasodium Etidronate, Benzyl Benzoate, Citronellol, Geraniol, Hexyl Cinnamal, Limonene, Linalool, Fragrance/Parfum. Deodorizing Additive: Glycerin, Propylene Glycol, Medicago Sativa (Alfalfa) Extract, Water/Aqua/Eau, Chlorophyllin-Copper Complex (CI 75810). Neutralizer: Water/Aqua/Eau, Hydrogen Peroxide, Dicetyldimonium Chloride, Lycium Barbarum Fruit Extract, Hydrolyzed Soy Protein, Ribes Nigrum (Black Currant) Fruit Extract, Sanguinaria Canadensis Rhizome/Root Extract, Argania Spinosa Kernel Oil, Cocos Nucifera (Coconut) Oil, Gardenia Tahitensis Flower Extract, C11-15 Pareth-9, Cetearyl Alcohol, Ceteth-20, Dimethicone, Disodium Phosphate, Isopropyl Alcohol, Phosphoric Acid, Propylene Glycol, Polysorbate 20, Tallowtrimonium Chloride, Linalool, Fragrance/Parfum.